Lewis Carroll is a pen-name: Charles Lutwidge Dodgson was the author's real name and he was lecturer in Mathematics in Christ Church, Oxford. Dodgson began the story on 4 July 1862, when he took a journey in a rowing boat on the river Thames in Oxford together with the Reverend Robinson Duckworth, with Alice Liddell (ten years of age) the daughter of the Dean of Christ Church, and with her two sisters, Lorina (thirteen years of age), and Edith (eight years of age). As is clear from the poem at the beginning of the book, the three girls asked Dodgson for a story and reluctantly at first he began to tell the first version of the story to them. Many half-hidden references are made to the five of them throughout the text of the book itself, which was published finally in 1865. The Deseret alphabet was developed in the mid-19th century by the board of regents of the University of Deseret (later the University of Utah) under the direction of Brigham Young, second president of the Church of Jesus Christ of Latter-day Saints. It was intended to help make learning to write English easier. This wasn't very successful, though the alphabet does have interesting phonemic features, as well as being a fascinating part of Mormon history. 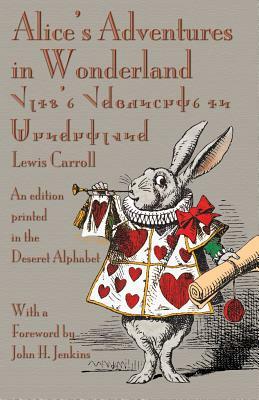 This edition of Alice's Adventures in Wonderland is written entirely in that same alphabet, with fonts specially designed by John H. Jenkins and Michael Everson.